It’s every collector’s dream to find a significant coin which is worth a fortune. And they don’t come any more significant than the Edward VIII Sovereign which has just smashed an auction record and netted £516,000. The incredibly rare 1937 dated gold ‘proof’ coin is the only single example available to collectors anywhere in the world. 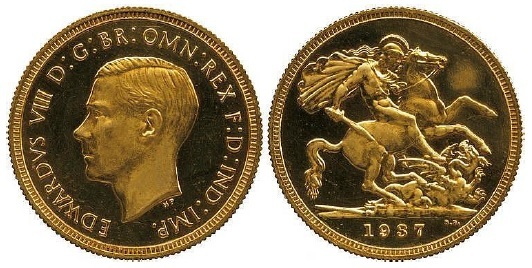 It was struck ahead of the King’s Coronation, however following the scandal which predicated Edward’s abdication from the throne in 1936, the coins became redundant and cemented their place in collecting folklore. His left-facing portrait; the same as his predecessor George V, also represents a unique deviation from a tradition which started in the 17th century under Charles II who wished to be facing the opposite way to Oliver Cromwell. “In the world of coins, it’s the coin’s story that makes it important and this coin has the most fantastic story” said winning bidder Mr Jordan Lott of Regal Rare Coins in Chester. After a tense battle in the Baldwin’s auction room and some fierce bidding, the coin eventually reached a winning bid of £430,000 and with fees included this took the total price to £516,000. The price is the highest ever recorded for a sovereign coin struck by the Royal Mint in the UK and possibly the best example of the numismatic significance of British coins in the collecting world.